The mountain range begins at Pico de Orizaba, and extends in a southeasterly direction for 300 km (190 miles) until reaching the Isthmus of Tehuantepec. Peaks in the Sierra Madre de Oaxaca average 2,500 m (8200 ft) in elevation, with some peaks exceeding 3,000 m (9800 ft). The eastern slopes of the range are wetter, intercepting moisture-laden winds from the Gulf of Mexico. A number of drier valleys lie to the west, in the rain shadow of the range. Other major mountain range systems in the region are the Sierra Madre del Sur to the south along the coast, and the Sierra Madre de Chiapas to the east. The Sierra Madre de Oaxaca pine-oak forests ecoregion lies above 1,600 metres (5,200 ft) in elevation. The humid Oaxacan montane forests ecoregion lies below 1,600 metres (5,200 ft) in elevation, on the eastern slopes above the Veracruz lowlands. To the east, the xeric Tehuacan Valley matorral ecoregion occupies the Tehuacan valley to the northwest, the Jalisco dry forests ecoregion occupies the upper basin of the Santo Domingo River, which lies in the rain shadow of the Sierra Madre de Oaxaca. The Southern Pacific dry forests ecoregion lies to the south along the Pacific Coast of Mexico, extending into the upper basin of the Tehuantepec River and the Valley of Oaxaca. Culturally and geographically, the Sierra Madre de Oaxaca System can be split into many smaller sierras or subranges, each with unique ecologies and human cultures. The Sierra Mazateca, located in northwestern Oaxaca state, reach elevations around 2,600 metres (8,500 ft). Cerro Rabon is its most unusual peak, albeit not its highest, the whale shaped "Holy Mountain of the Mazatecs." It is the homeland of the Mazatec people. Important towns include: Huautla de Jiménez, Eloxochitlán de Flores Magón, and Jalapa de Díaz. The Sierra de Cuicatlan, south of the Sierra Mazateca, are a range which divides the low canyonlands of Cuicatlan from the Sierra Juarez to the west and is home to the Cuicatec people. The Sierra Juárez is the land of the Sierra Zapotecs. It is the birthplace of Mexico's only indigenous president, Benito Juárez. The main towns of the Sierra Juarez are Ixtlan de Juárez, San Ildefonso Villa Alta, and Villa Hidalgo Yalalag. 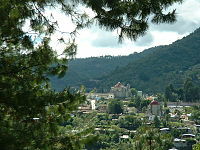 The Sierra Chinanteca, north of the Sierra Juárez, are home to Chinantec towns including Santiago Comaltepec, San Pedro Yolóx. and San Felipe Usila. The Sierra Mixe are to the east, as the Sierra Madre de Oaxaca descends towards the Isthmus of Tehuantepec, lies t, home to the Mixe people, descendants of the Ancient Olmecs of Mexico's Gulf Coast. The major Mixe centers are San Pablo & San Pedro Ayutla, Santiago Zacatepec, and Santa María Totontepec, and the major peak of the area is Zempoateptl, the sacred mountain of the Mixe people. Ricardo Flores Magón (left) & brother Enrique Flores Magón in the Los Angeles County Jail (1916). Benito Juárez: First indigenous president of Mexico, born in the Zapotec community now called Guelatao de Juárez in his honour. Ricardo Flores Magón & Enrique Flores Magón: the two famous Mexican anarchists and founders of Magonismo were born in the Sierra Mazateca, along with their brother Jesus Flores Magón, a more moderate politician. Sierra Norte de Oaxaca — region of the range. This page was last edited on 24 June 2018, at 22:03 (UTC).